I recently gave my bedroom a makeover. And I made sure the bed was the focal point. That’s one of the reasons I did the full height board and batten wall treatment–I didn’t want it to compete with my bed as a focal point. I’ve never had a beautiful bed, and I wanted that to change. The final touch to my room makeover was finding the perfect bedding. And where did I find it? Crane and Canopy. I chose this beautiful duvet set from Crane & Canopy. Don’t you love it? I love, love, love it. It’s called the Mirabel White. 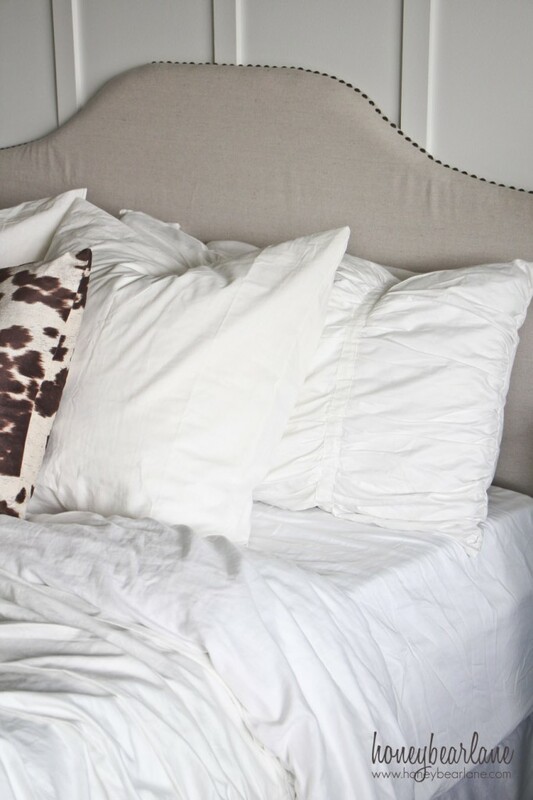 I’ve always loved white bedding, since it allows you to switch out whatever accessories you want and if you have nothing BUT white on there it’s still creates a beautiful, dreamy look. 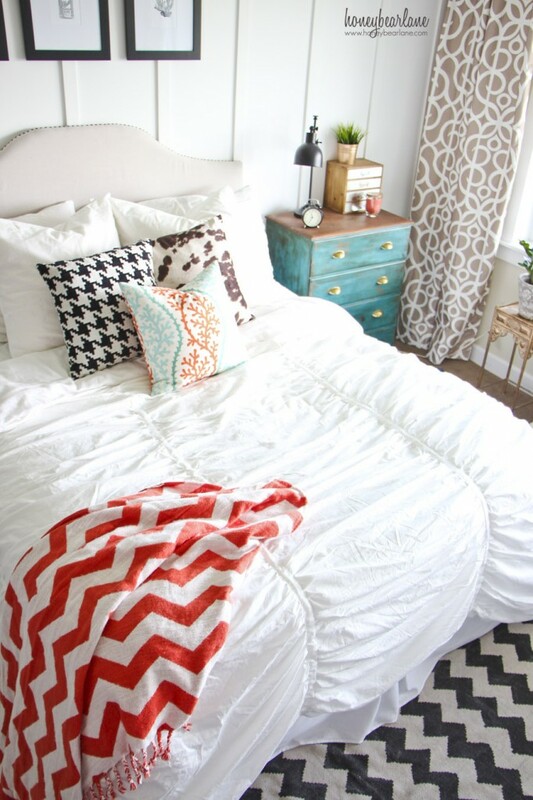 Duvet covers are a great way to extend the life of your duvet, but also the easiest way to add impact to your bedroom. And this Crane and Canopy duvet cover is high quality. Each corner has a little tie to tie to my duvet (which conveniently has little loops for that very purpose) and the whole thing zips shut with an invisible zipper. The King size shams are the same way. High quality, people. Duvets can been frustrating when they slip around your duvet and you’re constantly adjusting it…these definitely help. My favorite feature of this particular duvet cover (and one reason I chose it) is the ruching. Since it’s gathered throughout the entire top, I don’t have to worry about the wrinkles. My bedding has always wrinkled really easily and ain’t nobody got time to iron your bedding every week. Or ever? I have literally never worried about that with this cover. It always looks great, and even though you can still see wrinkles in these pictures, it’s really not noticeable in person. PS–it’s hard to photograph white bedding and really capture the details. Just know this looks much better in person! Did you notice the shams? I got the king-size shams because I already had Euro shams but now I wish I’d gotten the Euro shams. They’re both pretty but the Euro shams stand out more. And actually, the way I arrange the pillows has a more textured effect this way. Either way, they’re both good. I feel like my bed put on a pretty white dress. 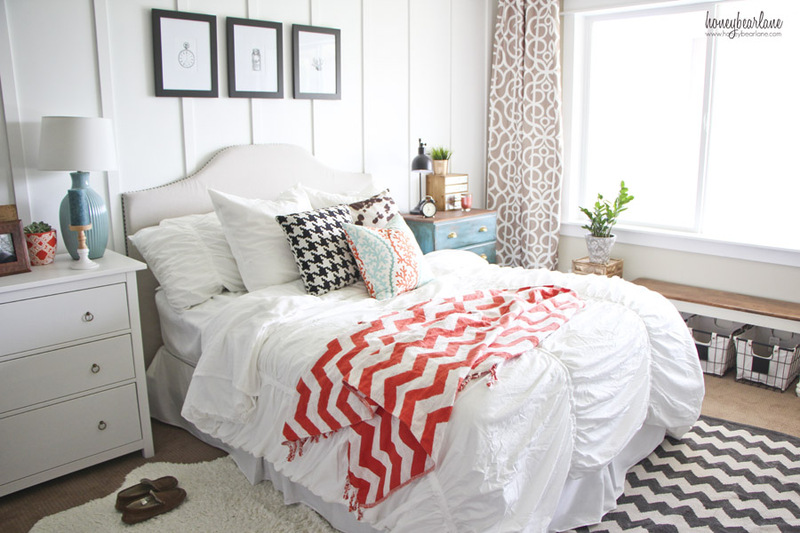 Do you worry about white bedding? Of all the white in my house, my bedding is hands-down the easiest to keep white. And with a cover, now all I have to do is wash the cover and it’s easy to treat for stains. The key to living with white stuff is care. You have to actually care about taking care of it. But when it comes to my bedding, I only have one rule–no eating in bed. And of course that does not apply to me because I’m perfect and NEVER spill. Seriously though, my kids are not allowed to eat in my bed. And that’s more because I don’t want their crumbs in my sheets. Having white bedding has never been hard for me to keep clean. I love my bed. Sure, the mattress is old and I wish it were a little bigger, but at the end of the day, when I climb into those soft, cozy sheets and sink into the memory foam, it is like someone just gave me a massage and a hug and a hot cup of hot chocolate at the same time. Heck, I’m writing this while I sit in my bed. And now that I’ve found the perfect Crane and Canopy duvet cover, I’m sure that it will be around for many years to come. What’s on your bed? 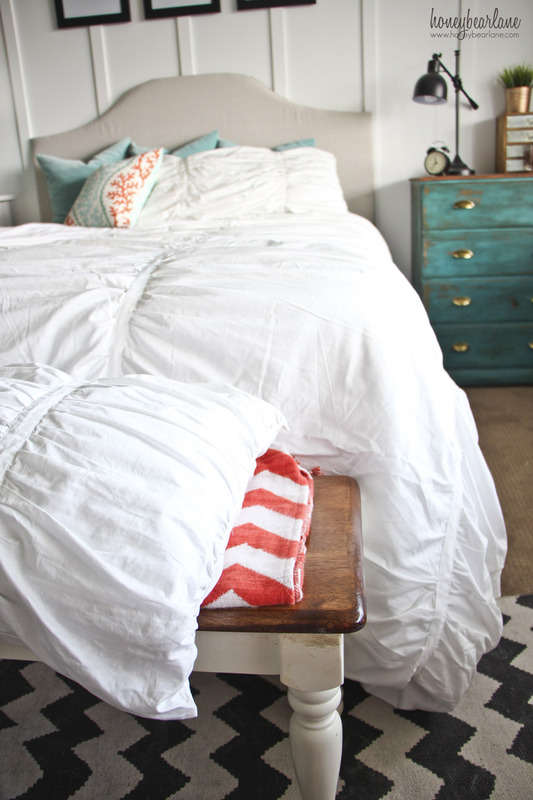 Are you looking for the perfect duvet cover? Check out the huge selection at Crane & Canopy. My friends at Lolly Jane just got theirs as well and it’s darling! And be sure to follow them on Facebook, Twitter, and Instagram! Heidi sooo gorgeous!! LOVE your styling, wow, girl!! Thanks ladies! Your room looked amazing too! Love this Heidi it is very pretty. Going to pop over and check out Crane and Canopy. Crane & Canopy has beautiful stuff…definitely give it a look! 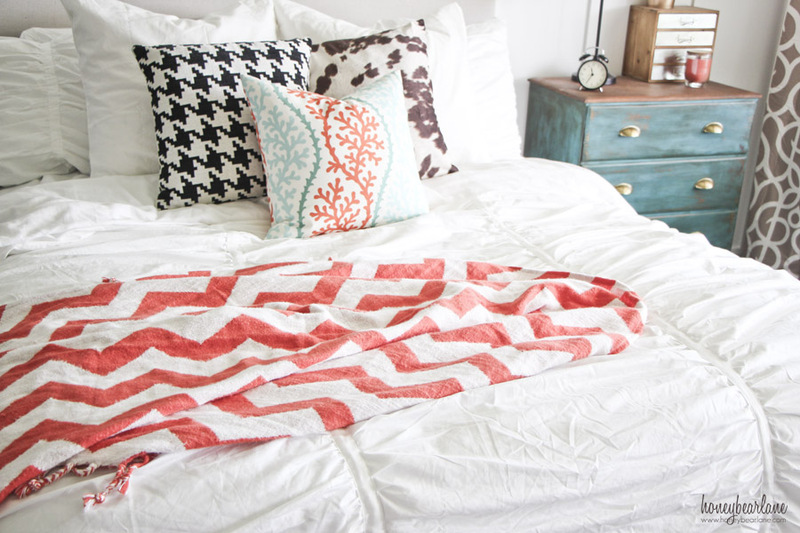 This is gorgeous—Where did you get your blanket and rug from? The throw blanket is World Market and the rug was Urban Outfitters. Thanks!